“Steadily it pursued its way, first tacking to port, then to starboard, and then driving straight ahead. 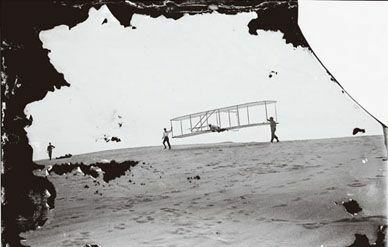 “ ‘It’s a success,’ declared Orville Wright to the crowd on the beach after the first mile had been covered. “But the inventor waited. Not until he had accomplished three miles, putting the machine through all sorts of maneuvers en route, was he satisfied. “Then he selected a suitable place to land, and gracefully circling drew his invention slowly to earth, where it settled, like some big bird, in the chosen spot. —Virginian-Pilot, December 18, 1903 The Dayton Evening Herald, which had run the Virginian-Pilot’s outlandish version of the Wrights’ first flight, published the brothers’ correction three weeks later. —Dayton Evening Herald, January 6, 1904 In 1904 and 1905, the brothers took the trolley to Huffman Prairie, a field outside Dayton, every day but Sunday to work ontheir Flyer. The locals had their own opinions about what the Wrights were up to. How fitting for the publicity-shy Wrights that the most accurate published account by a witness of their flights appeared in an obscure journal called Gleanings of Bee Culture. The editor, a beekeeper, wanted to find out for himself if the rumors of the Wrights’ flying machine were true. On September 19, 1904, he drove 175 miles from Fairfield to Dayton, Ohio; the next day he walked over to Huffman Prairie and watched as the two brothers went to work. SKEPTICS Afraid that others would steal their technology, the Wright brothers stopped test flights by 1905 and focused instead on securing patents for their control system and contracts with the U.S. and French military. For three years they refused to fly their machines, and their secrecy left them vulnerable to naysayers’ lambasting. FANS AND RIVALS By the time Wilbur and Orville began regularly staging public flights in the United States, most Americans and Europeans had read about their exploits in the newspapers. But even this more savvy audience found itself transfixed by the sight of an actual airplane buzzing overhead. For many it was tantamount to a religious experience. Even the Wrights’ most avid critics had to admit that the brothers’ flights were infinitely more sophisticated and successful than anything anyone had done in an airplane before. But that didn’t keep some competitors and aviation “experts” from chiding the brothers, especially Will, for their arrogant and aloof manner or the peculiar design of their Flyer. THE TWILIGHT YEARS Both of the brothers loved the process of invention more than the business of capitalizing on their success. Just three years after Wilbur died of typhoid fever in 1912 at the age of 45, Orville quit his job as the president of their airplane manufacturing company. Without his brother Wilbur around to argue with, life just didn’t seem as stimulating for Orville, who attended as few public functions as possible. LOOKING BACK We all have our own personal aviation history: The first time we flew in an airplane or watched a jet leave a trail overhead. Betty Wright Strother, 97, has memories that rise above such standard fare. She was on hand for two of aviation’s most significant events. In December 1941, she was living in Pearl Harbor, where her husband was stationed, when the Japanese attacked. Thirty-two years earlier, Betty and her parents had been in the crowd that gathered at Fort Myer when Orville Wright (no relation) flew. “Whenever something of interest came up, my mother and father got us inter-ested too, so that was the case on us going over there and seeing that plane. We went in a horse and buggy.